Makeup trends change up so quickly that we hardly manage to keep up with all of them. Here we are to take a look at the biggest makeup trends for the moment. Do you need a cool update in your makeup routine? Keep on reading and you’ll discover more about the latest innovative and stylish solutions in the fashion world. Before trying out any of these makeup ideas, make sure you choose the best options for your face shape, facial features, eye shape and skin tone. Shades of neon are the boldest and most eye-catching hues you can ever meet in your life. They are impressive and unusual to look at. It goes without saying that the use of neon hues in makeup is something too brave and unique. Stoplight red, traffic-cone orange, bright green, hi-vis pink are the main shades of neon we see as bright colors for eye and lip makeup this summer. They hold a kind of electric effect that’s so shiny and fresh. Combining all the possible trendy eye shadow ideas you can use matte neon colors to brighten up your eyes. As for lips, you may use both matte and glossy neon lipsticks. When we say Cleopatra liner we usually mean the bold black liner that wraps around the entire eye. This style is special for those with small and narrow eyes. If you have light eye hue then the result will be even more impressive and interesting. However, Cleopatra liner goes well with all eye hues and can complement different eye shapes. 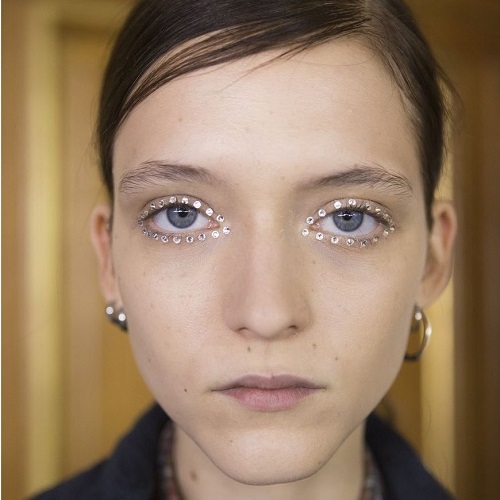 Your next prom makeup may be rhinestones. 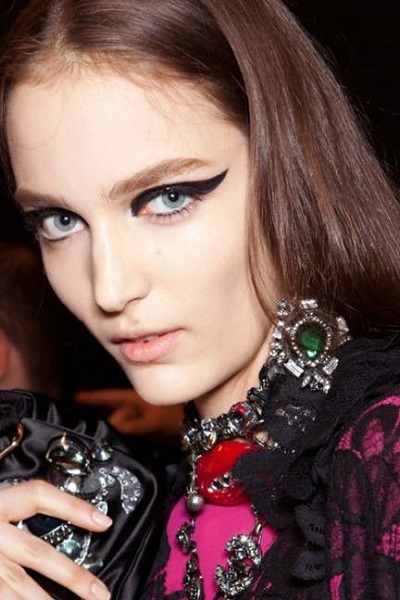 This makeup trend is seen on runways. It’s a new way of beatifying eyes. Makeup artists use Swarovski crystals instead of common eyeliner, placing them along the top and bottom lash lines with the help of eyelash glue. As a result, they create a festive eye makeup that draws so much attention. The use of oil-based lipsticks increases due to the slick lips makeup trend. While this is not something new in makeup but it is back with more creative and fascinating techniques. Nowadays you are recommended to use high-quality oil-based lipsticks with natural-looking hues. As a result you get luscious, luxurious and glossy lips that compliment your lip color and skin tone. This is the makeup trend that tells you “there is nothing right or wrong for it”. And here is another big makeup trend for your shiny eyes. It’s the sunrise eyes makeup idea that stands out with its creativity and uniqueness. We have never seen a yellow eye makeup trend inspired by the sunrise. 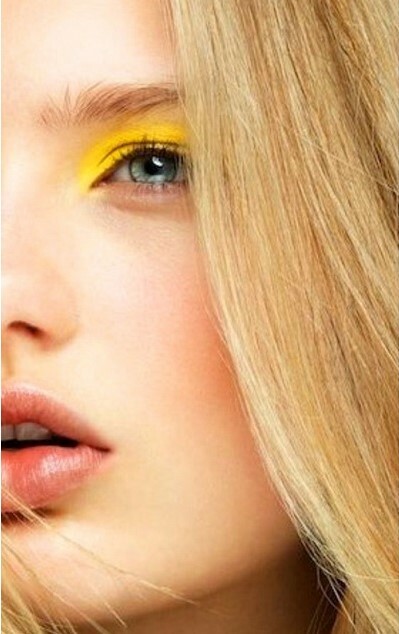 This time makeup artists use the many shades of lemon and yellow with some wet effects to create sunrise eyes makeup. There are many matte eye makeups achieved by yellow hues, but this is something different. The chosen shade is slightly pastel in its subtleness and is accompanied by a kind of brighter and shinier finish.